Soccer & Darts Combined in a Big Way! Description: This inflatable game is sure to get everyone's attention, it has been featured in many tv show and now were proud to offer it to our customer. Try our soccer darts inflatable game. Each game comes with 4 balls that stick to the velcro target, who ever hits the bullseye or has the highest score wins. 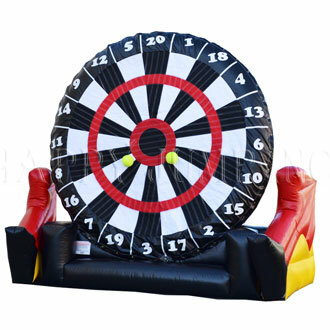 Give us a call to book this inflatable soccer darts game in Northern New jersey.